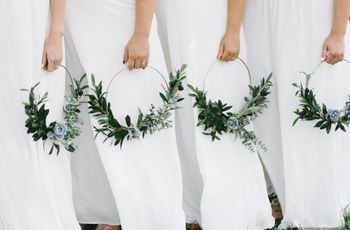 Try out these fun bridesmaid bonding activities to help your bridal party get to know each other a little better before the big day. If your bridal party is a mish-mash of family members, friends from college, and your childhood besties, chances are they don’t know each other well. 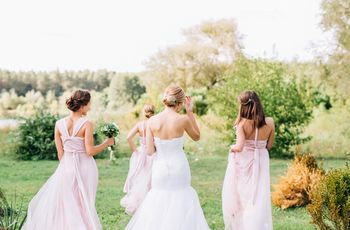 And while not every bride thinks it’s important for her ‘maids to bond — which is fine, since their main job is to stand together in support of you for a few minutes during your ceremony — others want their girls to get along (no bad blood here!) and to share something special during the wedding-planning process. If you're in the latter group and are looking for some fun bridesmaid bonding activities, you've come to the right place! This is the simplest way to introduce your bridesmaids to one another. 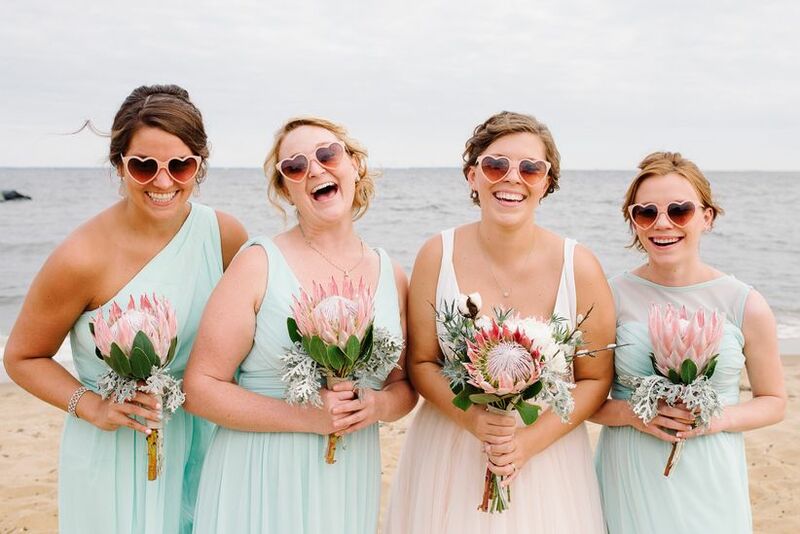 The group text could start as a place for everyone to say hi, but it could become a venue for sharing inside jokes, funny stories about the bride, or logistical details about the wedding. Plus, if your girls are planning your bridal shower or an epic bachelorette party, they’ll need to be able to contact each other without having to go through you, so having each other’s phone numbers is key. Do it for the ‘gram or keep ‘em for yourselves (or for a fun bridesmaid gift idea!) 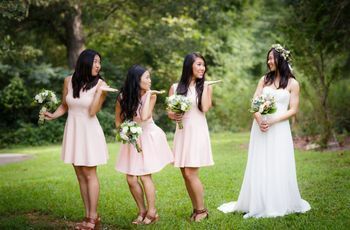 — either way, doing a friendship photo shoot with your ‘maids will produce some pretty special keepsakes for you, and it will also create an environment where your friends can get to know each other and crack up over hilarious poses and photos. Head to a park, a kids’ splash pad, the beach, a parking lot — wherever! 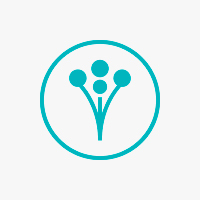 You could even come up with a theme or different ideas for photos on the fly to make things fun. Cook a giant meal together. Instead of hosting a potluck, ordering pizza, or just whipping something up for your bridesmaids, ask them to come over and help you prepare a big lunch or dinner — then sit down together and share it. Divide up the prep so that each friend has a job, and make it fun by blasting music and passing around a bottle of tequila the whole time. Your bridesmaids are sure to be lifelong friends by the time the meal is finished. Nothing says bonding like a night out dancing (unless, of course, you and your ‘maids are on the quieter side — then you’ll probably want to skip this). If you have a place you love to go or a type of music you prefer to dance to, get your friends together for a drink at your place beforehand, then put on your comfiest flats and hit the dance floor (because no one wants sore feet in the morning!). Go away for a weekend. This option is great for groups who might not know each other well, but have met before and gotten along. Two nights away together at a poolside destination or in a cozy cabin will definitely help your friends get to know each other. Remember to pack some board games, movies, tons of wine and snacks, and spend some quality time with each friend while you’re out of town. Host a brunch and share your favorite stories about each 'maid. While your friends sip mimosas and gorge themselves on waffles and scrambled eggs, take a few minutes to share a special story about each bridesmaid. It could be heartfelt, hilarious, or something in between, but brunch is a nice opportunity to thank your girls for standing by you, and also to tell them why they mean so much to you. 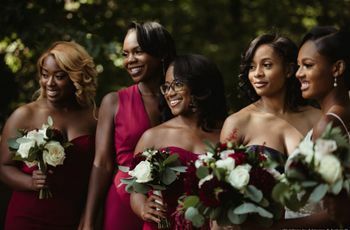 While you’re sharing these stories, you can also find ways to connect your bridesmaids — maybe they met in a similar way, know someone in common, or hated the same prof in college. Help them get to know each other! This one’s sort of like a “weekend away lite.” If you’re not sure that your girls will enjoy an entire weekend away together (hey, they could all have very different personalities!) just host a sleepover at your home, or rent an Airbnb for one night where everyone can sleep comfortably. You could cook a meal together, share stories about your girls, and do many of the other things on this list that night — talk about bonding!